Using social media can be overwhelming at times. Here are five useful tips to help you along the social media highway. 1. Comment on blog posts that you read. Not only will you be putting your name out there, but you will also be giving feedback to the blog owner. If it is relevant to something you have written about before, add a link in your comment to your blog post. 2. When you find something interesting online, like a cool video, blog post, interesting article or photo gallery, share it with others through whatever social media outlet you have. Quantity of posts/content is great, but the quality of posts/content is more important. 3. Remember to say “Thank You” when someone retweets, shares, posts, or comments your content/post. Being polite online is just as important as being polite offline. 4. Don’t get discouraged – the only way to get used to social media is to use it. Online networking, just like networking in person, takes practice. Keep in mind, not everyone will be your friend. These are just the tip of the iceberg. Check out our Social Media Guide for more information on using social media. 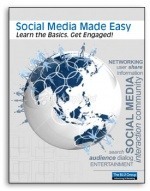 It’s FREE and covers a range of social media outlets including Facebook, Twitter, Foursquare, LinkedIn, and more.